I-Ortho is proud to have many adult patients in our practice. We offer a variety of esthetic options as well as traditional braces- whatever best fits your lifestyle. More adults are turning to orthodontic treatment these days, and for good reason. Orthodontic appliances are now hardly noticeable and give adults discreet choices that maintain their professional image. These adults realize that upgrading their smile may have social and professional benefits. Straightening teeth can increase self-confidence and bring joy back into your smile. Teeth can be straightened no matter your age. Yet, adult orthodontic treatment differs in two ways from children’s orthodontics. To begin with, jaws are fully developed and done growing by early adulthood. Adult jaw structure can’t be changed with orthodontic appliances like the way it is altered for growing child. Next, periodontal (gum) disease is more common with adults than children. Periodontal health impacts the ability to move teeth through the adjacent bone with orthodontic appliances. If the gums are not healthy in this process, bone loss may occur and harm your prognosis. Periodontal disease needs to be treated before orthodontic procedures begin. In order to successfully keep your gums healthy, you should have dental teeth cleanings and practice oral hygiene daily. 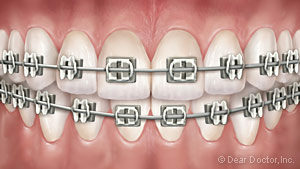 Traditional Metal Braces consist of small metal brackets adhered to the outside of the teeth. The brackets are connected by a thin, metal wire. The wire connects to metal bands that surround a back molar. 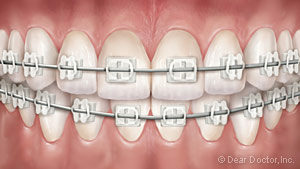 Clear Braces are a more discrete option than the traditional metal braces. The brackets are ceramic or plastic material. They blend in with the color of your teeth, besides the thin metal wire connecting the brackets. One thing to note is that they break easier than metal braces. Clear Aligners are a great alternative to the fixed type of previously listed orthodontic appliances. 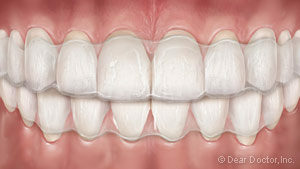 They straighten teeth through a progression of removable, clear plastic trays that you wear for 22 hours a day. The aligners have computer software that creates a virtual picture of your bite. 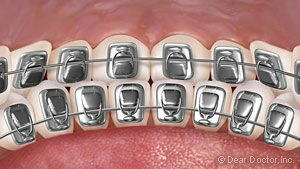 Lingual Braces attach to the back of your teeth and are completely hidden. It takes time to get adjusted to their feeling and they are a little more costly than metal braces. The most important thing after orthodontic treatment is wearing your retainer, regardless of your age or the type of appliance you had. Teeth return to their original position unless they are held in place by a retainer long enough for bone to grow around the teeth. We would hate to see that happen. We will take every measure to enable you to keep your new, beautiful smile so that you still look and feel great for years.